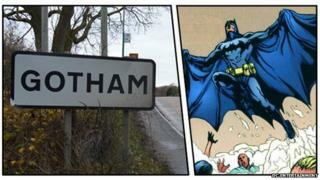 A village road sign believed to have been stolen by Batman fans has been found. Gotham, which shares its name with the comic book superhero's home city, had its sign stolen for the third time in four years last year. Police have said the sign - believed to be the most stolen in the county - was found during a raid in Loughborough. Nottinghamshire County Council, which owns the sign, joked it will "send the Batmobile" to collect it. Loughborough Police tweeted a picture of one of its officers holding the sign following a search warrant in the town. The council replied it had "all the hallmarks of the Joker's work". In reality, a 39-year-old man was arrested after the raid on 16 June on suspicion of possession of class A drugs, theft and abstraction of electricity. He has been bailed pending further enquiries, Leicestershire Police said. Police suspect it is the village's comic book city's namesake which has caused the sign to be stolen "as a souvenir" so many times. Chairman of Gotham Parish Council Mike Shepherd said he was "amazed" it had been found. "We're looking at putting new signs up that aren't so easy to remove," he said.